As the New York Times observed in 1961, “So swift have been the advances in the technology of flight that the life of a man born in 1900 may span the beginning of aviation in 1903 to the beginning of solar system exploration.” It’s easy to see why a lunar colony seemed so well within our reach during the Space Race. And though one never quite materialized, the notion of a Moon colony has never fully left our collective imaginations. Today, lunar outposts make regular appearances in space planning, whether for their own sake, or as a test bed for the human exploration of Mars. Here are five big plans (and a few other ideas) to colonize the Moon. When the China National Space Administration landed a rover on the moon in 2013, the U.S. followed it around with the Lunar Reconnaissance Orbiter just to be sure Beijing was being forthright. (It was.) China has also previously placed into orbit spacecraft to map the moon, and their long-term lunar ambitions include a sample return mission. In 2014, China’s state newspaper reported that a lunar colony is in the works, citing Zhang Yuhua, deputy chief designer of the Chang’e 3 lunar mission. “In addition to manned lunar landing technology, we are also working on the construction of a lunar base, which will be used for new energy development and living space expansion,” Zhang said. China aims to make a soft landing on the far side of the moon by 2019—which not even the United States has done before. In the 1960s, the Soviet Union took several stabs at designing a lunar outpost, and it’s plausible they might have succeeded. For much of the Space Race, after all, they flew rings around the American space program. First came Sputnik I, the first artificial object to orbit the Earth. Laika the dog was the first animal to orbit the Earth. Luna-1 was the first spacecraft to orbit the sun. Then Yuri Gagarin became the first man in space and the first to enter Earth’s orbit. The first woman in space was Valentina Tereshkova. The first soft landing on the Moon? Luna-9. The first sample return mission? Luna-16. The Soviet Galaktika project worked out several moon base configurations. Among the power sources considered were nuclear and solar. Breathable air for the base could come from a greenhouse, which would also double as an R&R area for the crew. Water, waste, and air would be recycled. The base was to be constructed in three phases, with a crew of eight to 12 living there for up to one year. A later proposal, called Zvezda, would also use three construction phases involving six launches total. Among the facilities and capabilities of the base: two laboratory-habitation modules and a laboratory-production module (which included biotechnology, physics, and technology labs, and an oxygen-generation facility). Zvezda could house six people. 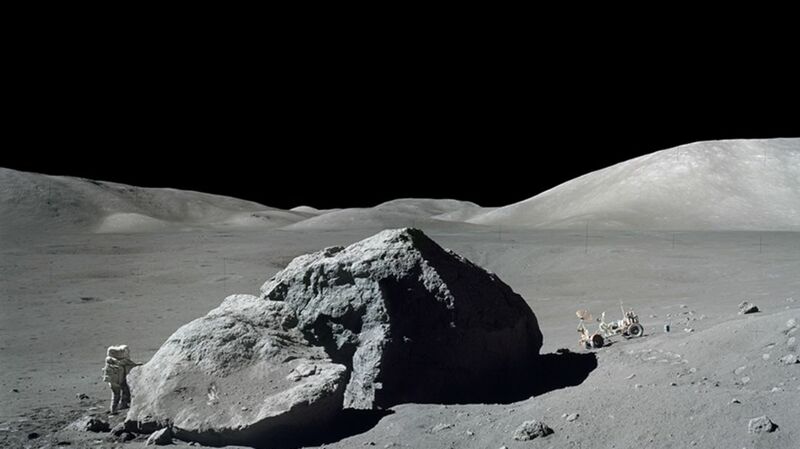 Ultimately, the proposal was abandoned when the U.S. didn’t bother building its own moon base. Today, Russia’s lunar aspirations involve a partnership with China. In 2004, the White House pressed for a return to the moon by 2020. The Constellation program involved a rocket, crew vehicle, and lander. It would have been, in essence, Apollo on steroids. Alongside the program, a solar powered moon base on wheels was planned with pressurized dune buggies for astronauts to drive without wearing their suits. By keeping everything on wheels, astronauts would have been able to explore the Moon in what was called a “super sortie mode.” The base idea died with Constellation in 2009. Though NASA has no current plans to build a moon colony, their website offers a solid rationale for such a project. A moon base would allow NASA to “test technologies, systems, flight operations, and exploration techniques to reduce the risks and increase the productivity of future missions to Mars and beyond.” A recent study suggested that such a base would be 90 percent less expensive than previously thought. Once the desultory asteroid redirect mission is finally canceled, astronauts will need something to do, after all. NASA’s human exploration and operations division still plans a manned Mars mission for the mid-2030’s, but that’s far too long to expect astronauts to cool their heels. As the International Space Station approaches its end of life, governments are looking at what they should do next. The moon is a ripe target. "It seems to be appropriate to propose a permanent moon station as the successor of ISS," Johann-Dietrich Wörner, ESA’s new director general, said. ESA’s plan for a moon base calls for an autonomous robot to land on the moon and get to work, Command & Conquer style, building the habitat. The machine would shove its “printer nozzle” beneath the moon’s regolith, and mix magnesium oxide with the lunar soil to create the base material. Binding salt would harden the material into stone. The result would be a habitat printed and pushed up, creating a kind of lunar hobbit hole. The habitat would be ready for humans in three months. The moon has garnered interest as a celestial mining town. For billions of years, solar winds have deposited Helium-3 onto the moon. It is an ideal, nonradioactive fuel for fusion reactors. In 2013, NASA asked Bigelow Aerospace to start feeling out the private sector’s interest in doing work beyond low-Earth orbit. Bigelow would be a key player in such a venture, as it is already in the business of building space habitats. (The Bigelow Expandable Activity Module, or BEAM, is slated to launch for the International Space Station in September 2015.) The project is further along than you might think. Bigelow has worked out the design of such a colony, and how it might be built. Last year, NASA solicited proposals for a cargo transportation and landing system. Now it’s just a matter of costs dropping until a healthy return on investment can be guaranteed.